1,560 sq ft; lot: 7405 sq ft - MLS# 1606571 Courtesy of Lake Geneva Area Realty, Inc. This newly constructed 2 bedroom 2 full bath townhome in Windmill Meadows has been appointed with luxury upgrades throughout. Single elevation main floor - no steps on main level including garage entry front door entry and rear door entry to patio. Offering approximately 1560 square feet and 2860 square feet with optionally finished 9' ceiling basement. 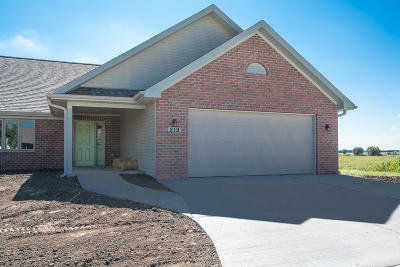 Upgrades include expansive vaulted ceilings fireplace hardwood/ceramic tile floors trim and solid core interior doors. Open kitchen with quality cabinetry separate stove top/corner oven dishwasher and disposal. Main level laundry. Windmill Meadows is a new subdivision in the Village of Walworth which includes attractive sidewalks and bike paths. Located within walking distance of schools restaurants and more. Easy access to IL.